Rio 2016 will employ 85,000 security staff, more than double the number who worked at the London 2012 Olympics. "There has never been anything like this in the country," said Games security chief Andrei Augusto Rodrigues. 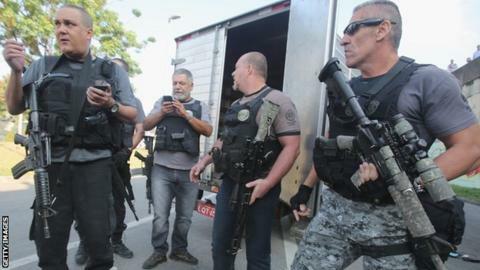 However, organisers will not repeat a policy used during the 2014 World Cup of occupying the city's favelas. Meanwhile the International Olympic Committee insists sailing and open-water swimming venues are safe. An investigation by the Associated Press news agency claimed that human adenoviruses - which can cause intestinal and digestive illness - were present in the water at those sites at levels "roughly equivalent to that seen in raw sewage". "Disease-causing viruses in some tests measured up to 1.7 million times the level of what would be considered hazardous on a Southern California beach," it added. Test events in sailing, rowing and triathlon are taking place throughout August with Britain's Olympic triathlon champion Alistair Brownlee and Finn-class world champion sailor Giles Scott among those taking part. The IOC said measures such as closing landfills and increasing water treatment works were continuing and that the World Health Organisation had assured it that there was "no significant risk to athlete health". A representative for the British Sailing team told Reuters that they were "not too worried" about the water quality.